LEAVE WE NOW THY SERVANT SLEEPING. John Garbutt was born in Easington, Durham in c.1824, the son of the labourer John Garbutt senior and Ann Pattison, who were married at Easington on 9 August 1819. He had three brothers: Thomas (born c.1819); William (born c.1821); and Robert (born c.1831). At the time of the 1841 census John (15) was working as a linen weaver and living at Hurworth-on-Tees near Darlington with his parents and older brother William: his father was also a linen weaver. His mother died there on 6 September 1842. By the time of the 1851 census John Garbutt (27) was a soldier in the Tower of London Garrison. Walter Garbutt (born in Oxford on 5 October 1869 and baptised at St Aldate’s Church on 8 December); died aged 3). At the time of the 1861 census John Garbutt (37) was a Serjeant in the 2nd Battalion of the Coldstream Guards, based in Wellington Barracks, London. 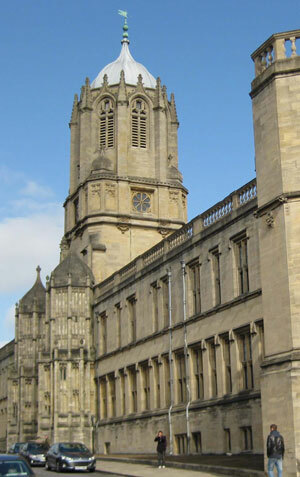 In about 1864 John Garbutt was appointed Porter at Christ Church, and he and his wife moved to Oxford with their only surviving son William. They lived in the main porter’s lodge under Tom Tower (right). Garbutt would therefore have known Henry Liddell (the Dean of Christ Church) and his nine surviving children, including the famous Alice, who was aged 12 when he arrived; and also Charles Dodgson (better known as Lewis Carroll), who had been Mathematical Lecturer there since 1855. Contact between Dodgson and the Liddell children, however, had ceased abruptly just before Garbutt’s arrival. In 1865 Alice’s Adventures in Wonderland was published. As the porter at the main entrance, Garbutt must have had to turn away Dodgson’s fans, and he was instructed to return to the senders all the letters addressed to him by the name of Lewis Carroll that arrived at the college. Garbutt’s last three children were all born in the porter’s lodge at Christ Church: Matilda in 1865, John in 1867, and Walter in 1869. At the time of the 1871 census John and Ann were living at Tom Lodge (the main lodge in St Aldate’s under Tom Tower) with five of their children: Anne (13), Caroline (12), William (8), John (3) and Walter (1). They had a servant, and another porter lived with them. The sixth surviving child, Matilda, was paying a visit to a family in Watford. Near the beginning of 1875 his first wife Ann Garbutt died at the age of 45. On 15 December 1876 at St Michael & All Angels Church in Paddington, John Garbutt (53) married his second wife Miss Emma Hathaway (36), who was born in Tetbury, Gloucestershire near the beginning of 1838. They do not appear to have had any children. By the time of the 1881 census John (57) had retired and was living at 9 North Parade Terrace with Emma (42) who was a milliner, and two of his children from his first marriage: Annie (23) and (John) James (13). His other two surviving children were away working: William (18) was a draper’s shopman, lodging with a many other young men over a large shop at 151–158 Tottenham Court Road, and Matilda (16) was working as a nurse for an ironmonger’s family in Reading. On 26 December 1885 at St Philip’s Church, Battersea, William London Garbutt (23), now a commercial traveller, married Helen Crosland (33) of 76 Wigmore Street. In the third quarter of 1893 in the Barnsley district of Yorkshire, John James Garbutt married Mary Theresa Brooks. 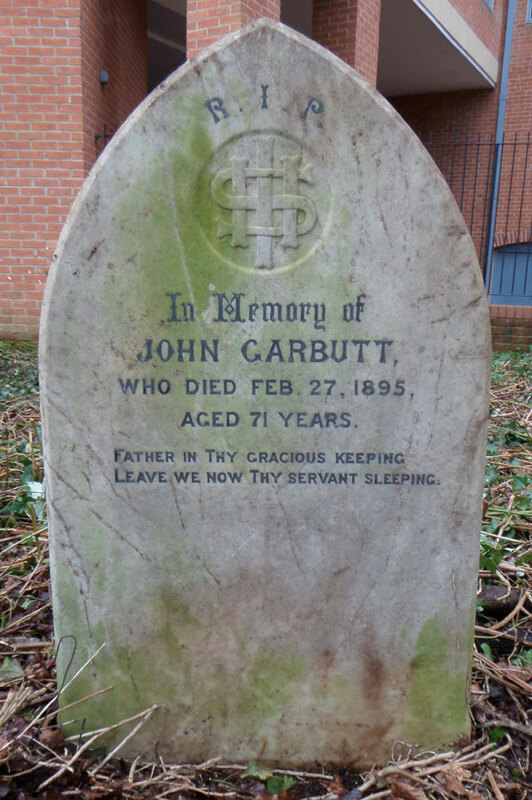 † John Garbutt died at 15 Leckford Road at the age of 71 on 27 February 1895 and was buried at St Sepulchre’s Cemetery on 2 March (burial recorded in the parish register of St Michael’s Church). His death notice in Jackson’s Oxford Journal read simply: “Feb. 27, at 15, Leckford-road, Oxford, John Garbutt, aged 71.” He would normally have been buried in the St Giles’s section of the cemetery, but there are a number of unexpected graves in the St Michael’s section, implying that they released some of their plots to other more crowded parishes. His effects came to £221 13s. 4d. John’s second wife Emma Garbutt moved away from Oxford, and in 1901 she was living in an almshouse in Ampthill, Bedfordshire. She died there in 1909 at the age of 70. Anne Maria Garbutt, Mrs Newman (born 1857) was living at 65 Sugden Road, Battersea in 1891 with her husband Charles, who was a bookseller, and their daughter Grace Henrietta Newman (6). In 1911 they were living at 24 Kirkley Road, Merton, Surrey with their son Henry Cecil Newman (19), who was an architect. Anne Maria Newman died in the St Pancras district at the age of 58 in 1914. William London Garbutt (born 1862) and his wife Helen do not appear to have had any children. At the time of the 1891 census they were lodging in Mayfair: he was working as a shop assistant, and she was a dressmaker. William died in the Marylebone district at the age of 37 in 1899. Matilda Garbutt (born 1865) was working as a certified nurse again in 1901, to a widow living at 82 Eccleston Square, London. In 1911 when she was 46 she was matron of a small nursing home with just two patients in Coltishall, Norfolk. She died at Ampthill, Bedfordshire at the age of 86 near the end of 1951. John James Garbutt (born 1867) was still working as a cabinet maker at the time of the 1901 census and was living in Warwick with his wife Mary and their sons John (6) and Albert (5). By 1911 he had moved with his family to Coventry where he was a body fitter at the motor works, and had six children: John Charles Garbutt (16), a repair boy at the cycle works; Albert (15), a driller at the motor works; Emma Gertrude Garbutt (13), William London Garbutt (9), Kathleen Jean Garbutt (1), and Bernard Arthur Garbutt (six weeks), John James Garbutt died in Nuneaton at the age of 85 in 1952.